Ohhhhhhhhhh brother. 2010 was a very exciting year for Elvis remix enthusiasts. This was the year that the Cirque du Soleil show “Viva Elvis” opened in Las Vegas. Controversial from the start, with reports from behind the scenes that the show was falling apart at its seams, with entire sequences being created, choreographed, then chucked out the window, no one was sure how Viva Elvis would turn out. Gone is that image, and in its place, the rough and rowdy rocker. But for remix enthusiasts, the hype about the show was nothing in comparison to the anticipation of how Viva Elvis would SOUND. 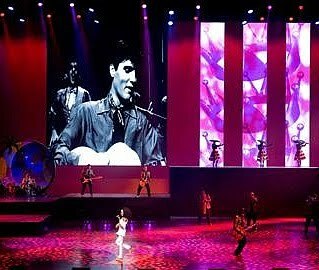 Cirque’s “LOVE,” which featured the music of the Beatles, had a soundtrack of over and hour and a half of remixed Beatles music, using only the original elements in the master tracks. The music of Viva Elvis was produced differently, however. With support from Cirque, Sony, and EPE, Erich van Toureau, a French-Canadian record producer, oversaw the project and watched every Elvis-related film, listened to every home recording, outtake, master track and live show available, and tried to put in as many Elvis-world samples as possible. Then, each song in the show received a completely 21st century arrangement, in genres ranging from hip-hop to gospel to punk rock to easy listening. Some of the music would be prerecorded, most of the new arrangements would be performed live on stage by a real rock band. The results were astounding. From the raunchy version of Blue Suede Shoes that opens the show (which borrows chord progression from a deleted song from “Girls! Girls! Girls!,” “Plantation Rock”) to the U2-inspired easy rock version of Suspicious Minds that closes the show, Viva Elvis encompasses so many genres it’s almost unbelievable. And for the most part, the tracks stick fairly close to their source, with a few notable exceptions: That’s All Right Mama sounds like late 80’s punk rock, It’s Now or Never is transformed into a Spanish-influenced tango, and King Creole into a jazz and hip-hop crossover, like old New Orleans meets new. There are upsides and downsides to the remixing of Elvis. Many older fans felt it was a violation of the original recordings, but those younger fans in supported the project, who saw “the big picture” pointed out that the original recordings are still there, not being replaced or diminished. This is no worse than a cover version, and perhaps better, since this at least features direct elements of Elvis. The Viva Elvis version of Suspicious Minds sounds like a U2-inspried track. Burning Love was converted into a near-clone of The Hives’ “Walk Idiot Walk,” which is a surprisingly pleasant transformation. And in multiple international versions of the album, “Love Me Tender” was included as a bonus track as a duet with regionally successful musicians from those countries.